This handy calendar of national days in May will give you a quick look at the month to find out how to celebrate your favorite national days with crafts ideas, food and drink recipes, plus some suggestions for activities. 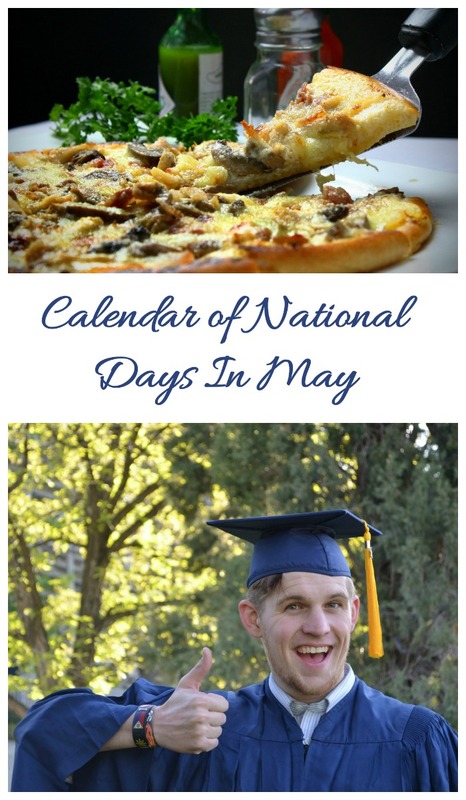 Each time I cover a new and fun national day about May on the blog, I add new links to the list below, to gives you new ideas for ways to celebrate these days. The list of important days in May is long this month. With the weather really being warm throughout the US, it gives us lots of opportunities for something related the the outdoors to become a national day. May is the fifth month of the year in our calendar. In the Northern Hemisphere, it is getting close to the end of spring, but in the Southern hemisphere it is associated with autumn. The name of the month comes from the word Maius. It is associated with Maia, the goddess of spring and growth. May is National BBQ month, which is apt, since Memorial Day falls at the end of the month and many of us barbecue on this day. It is also National Hamburger Month, National Strawberry Month and National Salsa Month. But don’t stop these activities, with all these other fun and unusual holidays, there is more than just outdoor eating to celebrate this month. 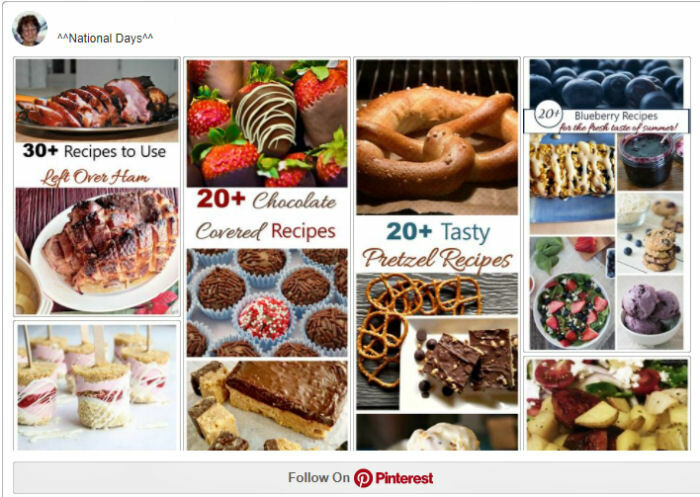 For more about the Food days in May, be sure to check out this post. It gives lots of ideas for ways to celebrate. The month of May has arrived, so let’s catch up with a few facts about this month where we honor our Moms. 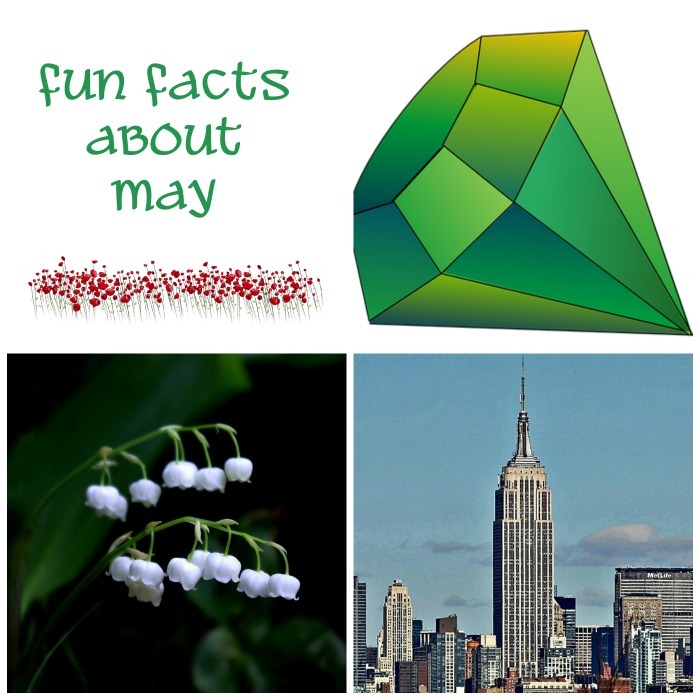 The birthstone of May is the emerald and the birth flowers for May are lily of the valley and hawthorne. Taurus (the bull) is the zodiac sign of May until the 20th, then Gemini (the Twins) is the sign from May 21 on. It was once considered bad luck to be married in May. There was even a saying “Marry in May and you’ll rue the day“. The Indianapolis 500 car race is held each year in May. Be sure to go to the Kentucky Derby on the 1st Saturday of May. The Catholic Church celebrates the Virgin Mary in May each year. Hand made May baskets with candy goodies used to be delivered to friends on May 1st but this is not such a common custom now. The Empire State Building was officially dedicated on May 1, 1931. The first Saturday in May is known as naked gardening day! The calendar below a list of May national days, day by day. Some of these days have links to pages on my site where you can find more information about that interesting and fun national day. I add to this page each week with new links and fun facts about your favorite national day, so be sure to check back often for new ideas. There seem to be more special days in May that in the other months. From May Day on May 1 to Mother’s Day on the second Sunday in May, there are dozens of days to celebrate this month. 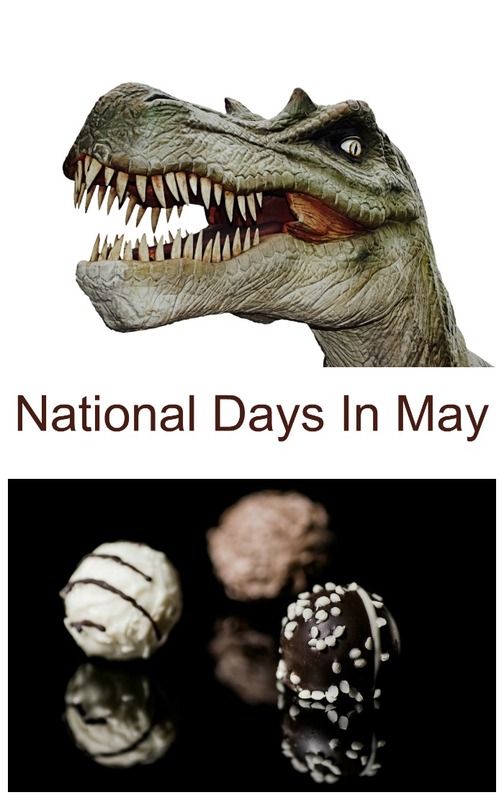 We even celebrate dinosaur day and National Truffle day in the first part of the month. Here we are half way through the month, already! Has your favorite national day been listed yet? Don’t give up. We have lots more fun national days coming up in May. How about National Rescue Dog Day or No Dirty Dishes Day? Both are still to come! Need More Inspiration for National Days? Which are your favorite national day of May? For next month’s calendar of National Days of June, check out this page.